But I ate healthy. So what to do? This was when the No-S-Diet kicked in. It immediately made sense to me. It was the answer to most of my eating problems - I was just eating too much and too often. And I liked sweets cycling from "No sugar at all" over "well, just dark chocolate" to "this is totally unrealistic - let's just eat it...". The No-S-Diet solved all of these problems. Now, 2 years later, I got rid of these 7 kilos again and I keep them off. It is not a temporary quick fix - it is an totally easy to follow set of habits that will keep you in shape for the rest of your life. Being a doctor you would automatically look for a diet that makes sense in a physiological way. And you would easily end up in the trap of producing something that is not applicable in real life in the long run, because you left out emotions, social situations, problems with will power and so on. Choosing a behavioral approach solves all these problems. And in my view it is a piece of genius. Einstein said you cannot solve problems on the level they appeared on but have to find a solution on another level (don't remember the exact words - but you get the meaning...). This is what the No S Diet does. The thing is: it feels totally natural to be on the diet. I don't see a single reason why not to follow it till the end of my life. It is the perfect balance between structure and discipline to have an effect on the one hand and freedom and choice on the other hand making it work in real life for the long run. So I use vanilla No S. I like to think of it as a framework or base layer for my eating habits. It gives me three plates a day to fill. When I am at home and can control what I eat I like to add a second level which is "healthy food". Also that I keep simple: always have some fruits or veggies and some protein on the plate. No big deal. But this is optional, a bit like the "intelligent dietary defaults" Reinhard writes about. My personal third level is adding the energetic approach of Traditional Chinese Medicine. To me this makes a lot of sense. This is how I "integrate" my interest and knowledge about food into the No S system. The big change to before is that I so often had stiff ideas what to eat and what not to eat that I couldn't relax having some delicious noodles in an Italian restaurant, even if it was only one in a while. Now I can play with these levels and switch in-between them as appropriate to my situation. This is the big freedom the No S Diet gave me. I (more or less) stopped reading books about nutrition where people tell me what to eat. Instead I started buying cookbooks and learn how to cook. My focus switched from nutritional value to "taste". How fantastic is that? I got rid of most of my diet books, filling the empty shelves with cook books. And I always have some No-S-Diet books at hand as presents to friends and family. Wow - NoSDoc - I love this post. You have summed up why NoS is the right way to go. In an era when "normal" eating no longer has a definition to most people, NoS gives us a framework to create "normal" eating habits for ourselves. We can adjust this framework to fit our own lives and tastes. "From diet books to cookbooks..." I love it! And from doctor (a 7kg lighter doctor, at that). Congratulations on your success and thank you for this thoughtful, informative, inspiring post! I'm going to have to track down that Einstein quote.... I'll post it here when I do. Great post, NoS Doc! Welcome to the board! I wish more docs knew about NoS! It would be a great thing to suggest to patients who need to lose weight. Thank you for this testimonial! I really appreciate it and you have put into words so eloquently what I know to be true, but love to see someone else feel too! Congratulations on finding this path! Fantastic testimonial..really loved reading this and find it very inspiring..thank you!! I really enjoyed your post, NoSDoc. For the past couple of months I've been paring down my somewhat large collection of books on diet and nutrition. Even got rid of some of my regular cookbooks that focus on a particular 'right' way of eating. At the library today I even ignored all the new magazines such as Health, Shape, etc. and wasn't even that interested in the foodie mags. Interestingly, I was at a thrift store and saw a copy of an old cookbook by the actor, Dom DeLuise. I flipped through it just out of habit and curiosity. It was filled with the joy of eating and cooking for friends and family. It made me want to cry thinking of how good life can be when not obsessed with dieting. Now, Dom was a big guy and he died at 75. But I have to say it looked like he really enjoyed his life! Anyway, good luck to you on your No S journey! 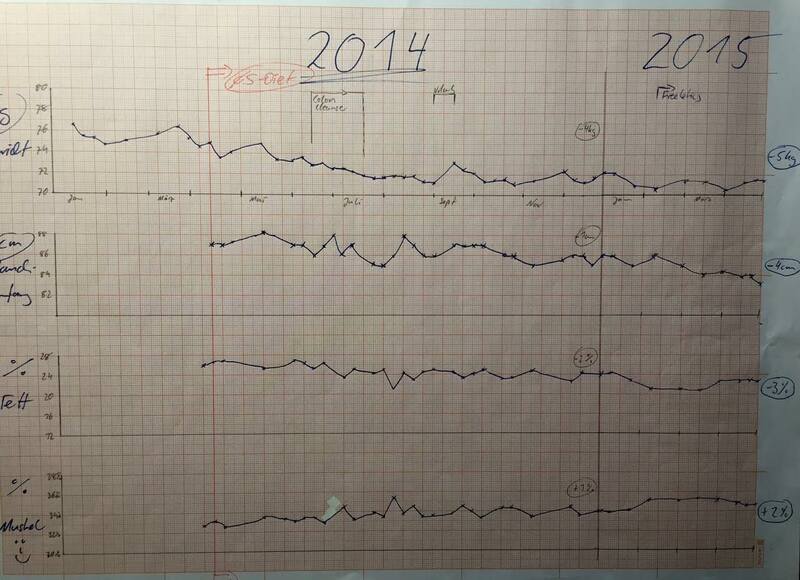 NoSDoc gave me permission to post an image of the graph he used to track his progress. Very impressive! What I found most interesting is what Reinhard also said in his Podcast #24: The No S Diet it is not a quick fix but a long term habit changing system. So as you can see all the graphs go up and down all the time with a long term downward trend. The message in my view is first: the system works! Yup! Second: be patient - it works in the long run, not on a day to day and even not on a week to week basis. But then you will keep the weight off. Don't loose faith if the scale is temporarily suggesting that you gained some weight that you thought was lost before. I am working on my 2016 graph. I you are interested we could post it after 2016 is over. By the way: thanks for your nice replies. I appreciate that! This is helpful and inspiring NoSdoc..thankyou. I'm noticing the gradual trend down..very gradual..and yes it seems 1 step down 1 back 2 down 1 back 2 down..for me its all about focusing on just doing the work, focus on habits and thinking big picture/ long term..so reading your testimonial is very encouraging. All the best! Neat stuff! It's especially interesting to me because I know that Germany has a lower average BMI than the U.S does, but I guess it's not because the people don't snack. What about junk food? Has that not overwhelmed the population yet? How many kilograms of muscle did you put on? I could figure it out, I guess, but I bet you know. That's an opposite trend to what usually happens, too. Isn't it nice to beat the odds? I had a doctor friend whom I had talked to about No S when he commented that I had lost and maintained my loss. I sent him a copy of the book, but it didn't take. (He told me he thought it was a bit of overkill to send it.) Haven't seen him in a few years, so I don't know if he ever changed his mind, found something else, or stayed heavy. Oh, well. Yes, please do plan on updating at the end of 2016.
thanks for your reply. Snacking in Germany is as common as it is in the US. From what I know you consume bigger portions at all, more soft drinks and more junk food, although it is on the rise in Germany as well. Thanks for answering my questions. Snacks and meals must be a lot smaller there. I think putting on muscle is possible, but if it were easy, there wouldn't be a jillion sites telling how to do it. Thankfully, being fit and living long don't require it. See you at your next check in. NoSDoc wrote: be patient - it works in the long run, not on a day to day and even not on a week to week basis. But then you will keep the weight off. Don't loose faith if the scale is temporarily suggesting that you gained some weight that you thought was lost before. Thank you for posting your wonderful testimonial - I am just about to post mine, and your message (quoted above) is JUST what I needed to have to hold onto, like a talisman, as I go into my second year. What a wonderful story! Thank you for sharing your inspirational success. Good things come to those who...work hard patiently!